"A warm easy meal made even easier in the slow cooker. These sausages may be served in sandwiches, or over rice." Place the Italian sausage links, spaghetti sauce, green pepper and onion into a slow cooker. Stir to coat everything in sauce. Cover, and cook on Low for 6 hours. 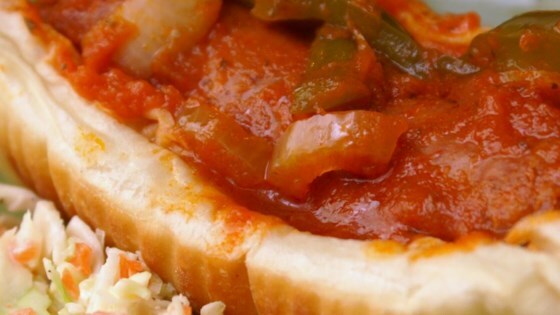 Serve on hoagie rolls. This is a five star recipe IF you simmer the sausages for about 10 minutes before placing in the slow cooker. If you don't the grease is extreme!